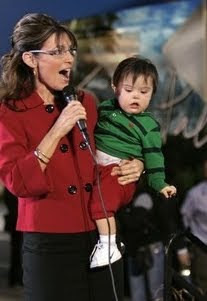 Sarah Palin took upon herself the responsibility of bringing up a child with Down syndrome. We have been very interested in how she does it and so far we haven't been terribly impressed with her efforts. Readers of Palingates send in many links of interest and one of them took me to a little gem of a blog, written by the mother of a child with Down syndrome who's roughly the same age as Trig Palin. Catherine Just is a photographer from LA and she has documented her pregnancy with Max, his diagnosis and his progress in delightful photos and videos. Coincidentally, Max was born on the 8th month of Catherine's pregnancy. Some of the similarities between Sarah and Catherine, such as the prematurity, words like "gift" and "miracle" and "challenge", made the dissimilarities very obvious. Catherine went beyond "talking" about Max. She and her husband Jerry took action. 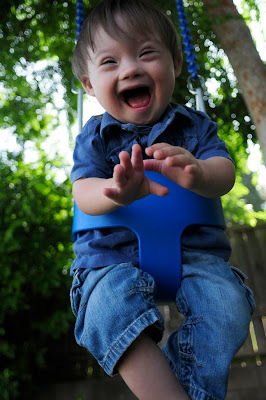 They wanted information, joined support groups, got in touch with other parents in the same situation in order to figure out how to meet Max's needs, how to offer him the best opportunities to fulfill his potential. "We are learning so much every day about what this diagnosis means and doesn't mean. It hasn't been easy to talk about with everyone - but we've gotten so much love and support about this and we are so grateful for that. Max is an incredible light that fills up our lives in so many ways. I'm so glad he is in our lives and I can't wait to learn more about him as he grows up and shows us who he is. I sometimes fear that I won't have a clue as to what to do or how to be the best mom for him and his specific needs and I am sure all the moms out there can relate to that one! 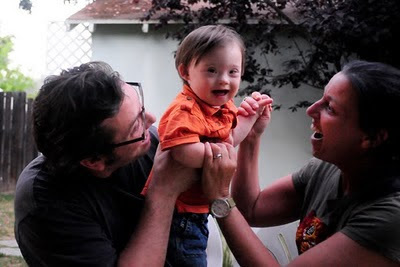 We signed up to be a part of the Down Syndrome Associate of Los Angeles and through that organization we were given the name of a married couple who also have a baby with down syndrome. They will be our mentor family. We've talked with them on the phone and plan on meeting with them soon. I'm so excited about that. It's nice to talk with other moms out there but to talk with one who also has a baby with similar needs as yours is so relieving in a way. I plan to sign up for everything possible. We are going to go to a group soon to meet other parents and I think that will be a great way to learn more about early intervention that we will get for Max, and what all is out there. There is a Huge round up in a few weeks that takes place at the skirball center here in LA and Jerry and I plan to go even though it's technically a "mom's luncheon"." We heard about Trig's haircuts, how he applauds each new day, how he needs protecting from Andrea Friedman and the Family Guy team. We followed the saga of the desecration of the iconic image of mother and child love when Eddie Burke's face was photoshopped into a picture of Sarah with Trig. In Going Rogue we learned that her sister Heather is the nurturing one, that God must have chosen the Palins for Trig because he knew what he was doing, that Trig will forever be the dependent little brother to his siblings. What we have never heard was how much she values networking with other parents, what wonderful work the Down syndrome groups in Alaska do for the families dealing with a child with special needs and how they helped with Trig or how much she owes them for their support when she felt overwhelmed. Sarah Palin made a donation of $1,000 to the National Association for Down Syndrome on the last possible day before her Pac report was due. That's how much the "You'll have a friend and advocate in the White House" DS mom did for the cause. That money was donated to her Pac by her followers, it didn't come out of the reported $12,000,000 she raked in from her book, TV deals and speeches in recent months. Let's continue to look at the contrasts between Sarah and other parents with children with DS. Catherine pointed out to me that actor John C McGinley, who plays one of the doctors in the series Scrubs, is the father of another Max, who also has Down syndrome. John was just as overwhelmed as any other parent when he learned that Max had DS. Did he say Max is an adorable miracle and stop at that? No. He and his wife tried to learn everything they could about the condition, joined groups, used his fame to promote events to raise money and awareness about DS; John C. gave numerous interviews and wrote articles where he pulled no punches regarding the irresponsible use of the word "retard." John C. is committed to building awareness and acceptance of people with Down syndrome. In 2002, he joined the National Down Syndrome Society as the National Buddy Walk Spokesman, providing significant national visibility for the program. He served as the 2005/2006 national spokesperson for the Society's annual Buddy Walks, advocacy walks that take place in hundreds of cities across the United States and Canada. A simple google search will return results pointing to countless blogs written by parents of children with special needs. I had a quick look at some of them and noticed that they share a few things: Networking, supporting special needs organizations, supporting other parents, asking readers to pray for a particular child going through a bad patch. They all celebrate their children and are proud to share their achievements and landmarks with their readers. They share resources, united in their quest to make their children's lives richer and the path a bit smoother. A bunch of unknown people do their best for their children and hope to raise awareness about their conditions, share what they know with others, giving tips and linking to helpful organizations. These parents want to make a contribution and make a difference in any way they can. Some of the contributors to Palingates, like StephiLou, tXdAd and others generously shared their experiences in the comments section. We learned from them and our little community was enriched, we became more aware in the process. Please note that I refer to parents of children with special needs simply as parents of children with special needs. They don't like to define themselves or their babies by their diagnoses. Sarah Palin, on the other hand, wears Down syndrome as a badge, using Trig and his condition to serve her own skewed agenda. That's why I refer to her as a "DS mom," in the same way she described herself as a "hockey mom." She likes to point out that she "chose" to have Trig, knowing he was going to be born with Down syndrome. So did many other parents. The big difference is that they saw the child first and the condition was secondary in their choices. Some other parents were not aware of DS before the birth of their babies, but again, they fell in love with their babies, not their diagnoses. They see themselves as parents and don't feel special because their children are a bit different. Sarah Palin is the most famous "DS mom" in the country. But apart from parading Trig all over the place in inappropriate attire, spouting some soundbites in her speeches and giving a token donation to NADS, she has done absolutely nothing for children with special needs and their families. She uses her Facebook page to attack people and not much else. There are so many avenues open to her if she really wanted to support families raising children with special needs... What's stopping her from creating a Facebook group dedicated to sharing stories about Trig, how he's making progress thanks to early intervention programs, giving links to resources, having a forum where other parents could tell their stories, talk about their triumphs and their struggles? If she would put a fraction of the energy she uses to attack people (in a very aggressive manner) into promoting a group dedicated to children with special needs instead, she could make a greater impact than all the little known blogs put together. But Sarah Palin is not about the positive. She's not for solutions or anything constructive. We can watch Max grow up by clicking on "hang on little tomato", now added to our blog list. The posts are heartwarming and informative and the photos are a real treat. Happy Birthday, Regina! :-) - UPDATE!